My experience in writing for diverse industries as helped me gain a lot of knowledge and experience in an array of areas. I have written engaging content for a variety of industries, including property, tax, mortgages, financial planning, family events, baby products, fashion, camping, travel, photography and much more! I have much experience in writing a variety of content, from writing articles, blogs and reports, copy writing, to formatting and styling mail chimp newsletters, to editing, reviewing, scripts, speeches and presentations. For over five years, I was a business freelance writer and wrote for many businesses, now it’s time for me to write for me. In doing so, I have created a multitude of blogs on an array of topics to share with you some inspiration to help you get started on your goals. When you are ready to begin, I have online courses to give you step by step instructions and helpful tips on how and where to begin and finish! Plus, for your leisure, I also have written fiction and non-fiction books to help relax your soul and bring a smile to your face. I love exploring and promoting the fashion industry. If you have a product that you would like me to review and post my review on my blog and a pic on Instagram, contact me today. I am transitioning over to a new blog that is all about my fashion ventures: http://melanietoyeallthingsglam.blogspot.com.au/. 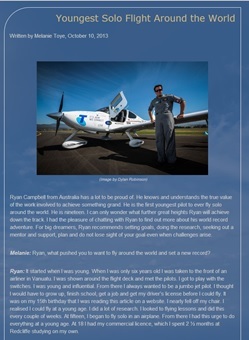 I have interviewed a range of stars, including Ryan Campbell the first youngest pilot to fly around the world, solo. Janet Evanovich, New York Times Best Selling Author. Leanne Stojmenov, a Principal Artist from the Australian Ballet. Nikki Webster a teen star who now owns her own dance studio. The Phly Crew and SYTYCD Australia winners, plus many more. If you are a business who wants me to interview someone for your publication, email me. Simply email me at: melanie.toye@gmail.com or complete the below form. I look forward to learning more about your opportunity.